We have been reaching out to random fans over the past 12 months to see what they want to see from their favorite artist, things they've noticed that are or are not being done to keep their interest and attention. Things they would find useful and things they really don't care about. We compiled all of these suggestions and thought we'd pass them on. We hope you find them useful. 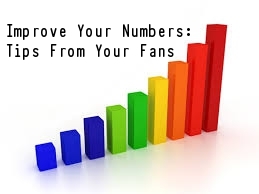 Your fans ARE what make or break your chances at success so their input is necessary and important. Without them, your music does not get heard. Thank you to those who gave their input over the past year with this project. Don’t just think of your audience only as fans of your music, they are also your customers. Think about their perspective not only in the music you create, but in the way you market your music and merchandise. They are the ones that spend every last dime they can on your cds, your iTunes downloads, your concert merchandise such as t-shirts, posters, etc. They are the ones that drive hours just to see YOU. They are your market, they are your success or your downfall. It's all about being "fan friendly". A.) Give yourself credit where credit is due. Your CDs should always contain information about your music (album, genre, date, song title, artist, contributing artists, etc). Never make someone who has purchased your CD have to type this information in when putting your cd in their playlist. Not only is it annoying to the user, you are missing an opportunity to establish your copyright and/or give credit to artists that have worked with you on the music. B.) Do not rely on the Internet to “find CD information” for your cd. New artists aren’t always found on these sites and why make someone who has taken time to purchase your CD go hunt for something you should have included in the first place. Care enough to include all necessary information. C.) Before burning CDs in masses, check your CD information on various media players (Windows Media Player, Real Player, etc.) and on various windows or mac operating systems (Windows XP, Windows 7, etc) to make sure CD information is properly displayed. Display info can vary by operating system and by player. Make sure all your customers are accessing the same information. Simply leaving “unknown” on your CDs makes your customers fend for themselves and prevents them from properly organizing their music. D.) Download cards are getting more popular. If you have download cards for sale at a venue, make sure that what you advertise on a display is what folks will actually be downloading. E.) If your customers download your music, make sure that you provide a wav or high quality mp3 file. The worst thing is for a customer to download a file, crank it up and hear static. Also make sure that all downloadable music is in a format that can be accessed by your customer. For example, an .aiff file won’t play on a PC. Make sure your music is accessible to all. F.) When you provide a sample of your music online, make sure it’s more than just 30 seconds. Many times, that short of a time doesn’t even get you past the musical intro portion of a song. At least a minute of music is needed for people to know if they like your song and are willing to pay to get the rest. 2. THE WEBSITE IS STILL KING, USE IT WISELY. A.) Organize, organize, organize. Design with simplicity in mind. If you have a site with lots of menu’s (and submenu’s), try to pare it down to the basics. If you have cool stuff like the fact that you are currently featured on another website (tv show, magazine, etc), have won awards, your song has just been sold to a high profile artist, or you can be hired for home shows, try to put that on the home page so people see it right away, you can always link to more information about it. B.) Content is the "Flavor" of your website. Remember, not everyone likes the same flavors so keep it simple and easy to access necessary information. Keep in mind that not everyone is as "technology savvy" as you are or your website creators. Don’t be too flashy (or use too much flash). Not everyone has the capability to see flash or java script. Ask your web designers to turn off these features so you can preview what your site looks like. Find the balance between meeting your need to be “cool” and your audience’s need to be able to actually see what you want them to. C.) Web pages look different on different computers and different browsers, sometimes significantly different. If you design on a MAC, make sure you check your website on a PC (and vice-versa). Also check your site on various browsers (Internet Explorer, Chrome, Safari, Firefox) as well as on a smart phone, preferably on an iPhone and an Android. D.) People using assisted technology (screen readers) are often unable to easily access information on a website. Ask your web designers about incorporating design elements (like mouse-overs for pictures and URL links) for people with disabilities in mind. It costs a little extra to design but can increase access by up to 15%. E.) Always include a bio. It doesn't have to be a page long, just cover the interesting and important facts about who you are, why you do what you do and how you got there. Believe it or not, people are interested. If you've performed with high profile names, put it on there. If you've been on a tv show, put it on there. Who are your influences? Is there a memory that stands out from your experience? If it's interesting, put it out there. F.) If you're a band, include the names and backgrounds of your band members, not just the lead singer. Fans want to know about you as a whole, not just about the front man. Believe it or not, some fans might just be a little more interested in the guitar player, drummer or bass player. If you're gonna be a band, promote yourself as a band. No member is insignificant. A.) Don’t buy t-shirts that run small. No women wants to buy a size XL if she doesn’t have to! Buy 100% cotton that runs larger (no Junior cuts!) Today's audience doesn't all wear a universal size and keep in mind that some of your fans wear larger sizes. Always have the option to order a XXL or even a XXXL. Nothing is more disappointing to a fan than going to your concert and seeing sizes they can't wear. This is money you are losing. They want to proudly wear your name across their chest and show others that they love your music, too. Country concerts involve drinking a lot of beer which results in the official "beer belly". Make room for the beer bellies, there are a lot of them out there! Not every body is made the same and isn't made to fit an XS. C.) Never NOT have samples of your music on hand and make sure you have plenty of it so you don't run out. Even if it's just download cards of your latest single, make it available. If you don't have a current single out, have copies of older music. You're an artist performing a show, you should have some kind of music for people to purchase at your show. If the venue won't let you sell your music, make sure you have information telling people WHERE they can purchase your music available. 4. USE SOCIAL MEDIA WISELY - "BE SOCIAL", "BE INTERESTING", "BE PERSONABLE"
A.) To be effective with social media, you have to use it. Try to post at least a couple times a day or a couple times a week at the minimum. Don't go for weeks or months on end with no postings. You will lose your audience and when you release new music, you have to start from scratch to bring them back. B.) Don’t make Facebook and Twitter look the same, the audiences aren’t the same and your content should be slightly different. For example, use twitter to follow organizations in your industry, get to know individuals promoting music to the general public, to the movie industry, etc. Ask questions about things within their expertise, things that could help you advance your career or opportunities to promote your work. C.) It’s ok to use standard show information but also personalize your social media. Be creative and be personal. You don't have to be TOO personal, but fans want to hear from you. Tell a little about why you like something, When someone has something nice to say about you, thank them publicly. Wish your fans a happy birthday. Write something about what you appreciate about them or your audience in general. Let people know what some of your favorite things are, what inspires you. Tell people a little about yourself. Tell the story behind a song. At least once a week, try to do something to make random fans feel special, tweet them a hello. Not one that is a response to something they've sent you, just a random hi and wish them a nice day. That's all they want, to know they matter. D.) You can pre-plan your social media activities by creating a social media calendar if you feel uncomfortable winging it. Write down on a calendar what topics you’ll tweet, Facebook about a couple weeks ahead of time. For example, find YouTube links you like ahead of time, put on the calendar what links you’ll send out when. If you’re about to release a song, span advertisement about that song throughout several weeks, tell your audience why you wrote it, what’s your favorite part, who helped write it, etc. Bits of information can be spread out through multiple weeks. Put your ideas on a calendar and it’ll be easier to remember and keep social media active. E.) For those on Twitter ... here are some of the many artists who personally interact with their fans on a regular basis and are hits with social media. Check them out, read their timelines, see what they're doing to get their numbers up - @OakRidgeBoys, @MarkWillsMusic, @CowboyTroy, @HelloJTHodges, @CraigCampbellTV, @Parmalee, @TGrahamBrown1, @JoeBonsall, @DuaneAllen, @GettinSweenered, @LukeCombsMusic, @BlakeShelton, and @JamesWesley1 just to name a few. F.) Be mindful of what you post. No one wants to hear your political rants, it's not cool to bad mouth other artists, and avoid the "offensive" or "R Rated" content. You can keep it personal but not too personal. A.) Don't just sing cover songs. We can hear that anywhere. If you have original music, play some of that as well. Mix it up a little. Most fans don't want to pay crazy ticket prices to hear you do someone else's music. Play YOUR music too. B.) Don't ruin a show by swearing and over drinking. Having a few beers/shots is fine but don't let it get to the point where you forget your lyrics, stumble over equipment, start bad mouthing people or start a diatribe of four letter words. Remember most of your shows that are not in a bar have children in the audience and people that just don't want to hear and see all of that. Be respectful of your audience, keep it fan friendly. If it's gonna be "one of those shows", let people know what they can probably expect. Now veteran artists, people already know what they can expect from past experience so going to those shows is kind of already a given, but if you're a new artist trying to get your name out there, this is NOT the way to do it. C.) Don't start late unless absolutely necessary. Some of your fans drive a long distance to your shows, have to work the next day, or have kids they need to get home to. Nothing is more irritating than going to a show, especially at a bar/club and having to wait an hour or longer past the scheduled start time for reasons such as "we're waiting on more customers to come in" or "the artist isn't back from the hotel yet". You know what the schedule is that's posted to your audience, so unless it's something you can't avoid, start on time. I've left many shows that weren't starting until much later than announced. A.) Don't rush a meet and greet because you scheduled it too close to your start time. Fans pay a lot of money and drive a long way and meeting you makes it all worth it except when they're treated like you're herding cattle. No one wants to be treated this way and it will result in hurt feelings, especially if you've charged some ridiculous amount that they actually paid to meet you. Set aside a reasonable amount of time to deal with a certain number of fans. If it's after your show, don't just tell people to get in line unless you're planning on staying until that last hand has been shaken, that last person in line gets their hug and their picture. Also, make sure your management treats them in a kind manner and not like they're an inconvenience. Nothing makes me madder than an arrogant, rushed tour manager being rude to fans who have waited to tell you how much your music means to them. They're people, not dollar signs. Treat them as the reasons you have a meet and greet to start with. B.) Put a limit on the number of things you will sign and make that clear when you notify the fan they have secured a meet and greet. Signing ten different items and listening to stories about each item not only angers those who are waiting, it cuts down on your time with other fans. Reality is, you are pushed for time, but your fans should not have to suffer because of that if rules weren't clear to begin with. If you are ok with unlimited items, then make sure there is enough time to deal with those or make alternate arrangements to have them signed and returned to the owner after you've done the initial meet and greet. It can be done, if you're willing to take the time. Fans know you're on a schedule but keep in mind, some of them are too. C.) Greet them with warmth and a smile. Don't greet them all out of breath, throw your arm around their shoulder with a forced smile and a pose and then call over the next person. Show interest in them, give them a genuine, firm, "nice to meet you" handshake and an honest smile. Say thank you for their support, thank you for coming and make sure they know they're appreciated. If it's someone you see at many meet and greets, try to remember their name. If you can't do this, don't have a meet and greet. Just some things to think about as we enter a new year that you may want to consider for your own fan base.